The Council rebuilds, post-war boom and decline. With a stable international situation again established the Corporation set to and upgraded their new asset. The mainline was rebuilt using 50lb rail for the running line and 25lb mounted on insulators for the third rail. At Aquarium an old tram shelter replaced the rather flimsy pre-war shelter while at ‘Half Way’ a completely new island platform and passenger access was created about 50 yards west of the car sheds and old station. Even the car sheds were rebuilt to allow all cars to be kept undercover. At Black Rock a new station was built to replace the 1937 building which had suffered badly during the war. Most of the steelwork for the platform shelters at ‘Half Way’ and ‘Black Rock’ came from wartime defences and aircraft scrap. The ‘art-deco’ style of station was designed to blend in with the architectural style of the Lido at Black Rock. As an be seen later the canopy at Halfway was constructed to match this style as well. Unfortunately the building used at Aquarium did not match this rather unique style. Wartime storage, much of it in the open, had taken its toll on the car fleet. 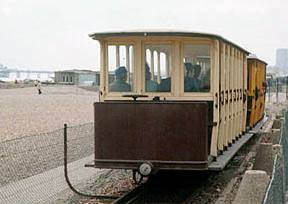 The 1897 built saloon had been withdrawn from service for dismantling and disposal in 1928, now it was the turn of original cars 1 & 2 from 1884 to meet their end. Worse still the comparatively young winter car had a severe case of the rust worm and was deemed beyond repair. 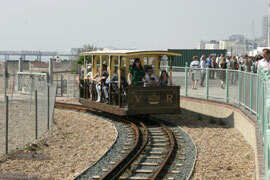 To fill the gaps two ex Southend Pier Railway trailer cars were purchased in 1949 and converted to motor cars. These became numbers 8 & 9 in the Corporation’s fleet and are seen in action right. And so the railway reopened from its wartime hibernation on the 15th May 1948 and settled down to post war normality. 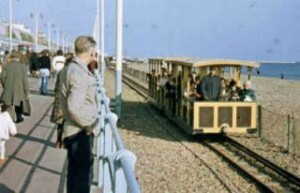 In 1952 the winter service was suspended to allow some track repairs but was reinstated after repairs were complete. The new, short-lived, winter service had the drivers selling tickets as well as driving the trains and was not a success. Winter services were not included in the timetable after the 1954 season and this has remained the case except in occasional circumstances. In 1961 control of the railway passed from Transport to Entertainments & Publicity. 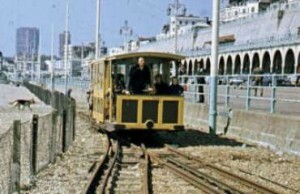 The new owners decided on a facelift and from 1962 cars started to appear in a new brown and yellow livery with VR and the Brighton crest applied to the sides. 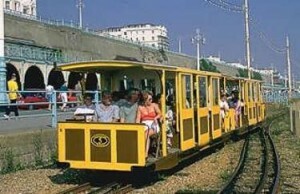 Like many other seaside towns Brighton was feeling the pinch caused by cheap package holidays. 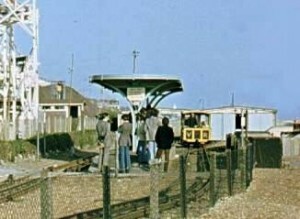 This, coupled with closure of the Black Rock pool in 1978 caused the railways passenger numbers to drop to an all time low – the railway’s star was beginning to fade. The development of ‘Half Way’ into Peter Pans Playground gave an added impetus to the fortunes of the railway and the trains were very busy. Cars still ran individually but operational regulations allowed the cars to follow each other line of sight. 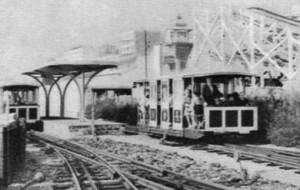 Having two platform roads at Aquarium and Black Rock certainly helped with the operation and also meant that one car was always in the station providing valuable advertising for the service. In 1964 the railway introduced 2 car operation whereby two cars could be coupled together with controls duplicated on each car. Not only did this mean that each two car train could cope with moving larger numbers of people it also halved the number of drivers required to operate the service. This type of operation also spelt the end of needing two platform faces at Aquarium and Black Rock and the sidings were eventually removed. So the railway survived beyond its centenary – it even survived a brief period of time when it was renamed ‘Volk’s Excursion Railway’! In the 1990s a new storm drain project caused great disruption to the eastern end of the line. The 1948 station was torn down and the line foreshortened by another hundred yards or so to a temporary station. For a while this station was connected to the Marina by Dotto Train but the service was unreliable and was eventually dropped. On completion of the work the line was reinstated to the site of the old station where a new platform had been incorporated into the Regency styled pump house. 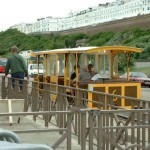 The oldest operating electric railway in the world! 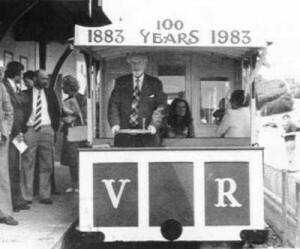 Volk’s Railway survives as the oldest operating electric railway in the world – it wasn’t the first but it is certainly the longest lasting. There is something about Victorian eccentricity that arouses the imagination. There is no doubt that Magnus Volk was a very clever man and through the trials and tribulations of operating an untried electric railway in a hostile environment he has earned a place in British folklore. Elsewhere on this site you will find more information on the history and technical details of the Cars, the changes to the route since 1883, plus details of train times, fares and the latest news. 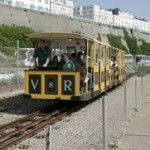 The Railway is supported by a growing band of enthusiastic people under the banner of ‘The Volk’s Electric Railway Association’ (VERA). Membership of this august organisation will keep you in touch with what is happening on the line and give you the opportunity of helping to keep Volk’s Railway alive for future generations.